If Cory Asbury’s hit single “Reckless Love” was THE song of the first half of 2018, then “You Say” by Lauren Daigle is THE song of the second half of 2018. While we have reviewed Reckless Love almost a year after the album released, and concluded that it was one of our favourite albums of last year, Lauren’s album Look Up Child was reviewed almost instantly- and the consensus reached for both albums was virtually the same. Both artists have been given a platform by God to reach millions of people in many music markets- it is truly and honour for them to show the world Jesus’ love. Now why am I speaking about these two artists in particular? How are they linked of course? Well by Cimorelli…who else? I think I’m sounding like a broken record here, but if you really haven’t listened to Cimorelli’s varied discography of original material as well as inventive covers- then I reckon you better hop to it and be immersed in the out-of-this-world brilliance of Christina, Katherine, Lisa, Amy, Lauren and Dani. You can read about all things Cimorelli here; and now that you have, let me be the first to say that their cover of “Reckless Love” is probably the best version I’ve ever heard. Period. No joke. 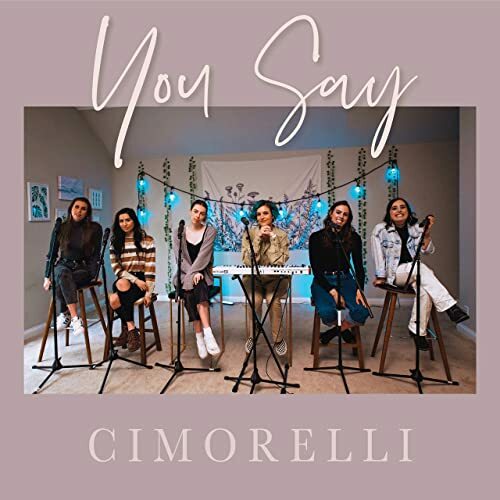 We’ve reviewed Cimorelli’s single last year and have already showered praise of their rendition; so when the girls unveiled their new cover last week to be “You Say” by Lauren Daigle, I figured I better stop and pay attention. And what a cover it is. Played only on the piano, all six sisters combine vocally in perfect harmony to create a stirring masterpiece, and one that Lauren Daigle herself would be proud of. The girls even change up the order of some lyrics to add variety to their cover- and it’s a change that I gladly welcome. I’m sure you all know about “You Say” by now- it’s been released since July as a single, and Lauren Daigle has been dominating the mainstream charts as well; so let me end this ‘review’ of sorts by showing you guys the video and by giving you a quote from my review of “Reckless Love” from Cimorelli– of which these statements are still applicable today! The sky is the limit for Cimorelli’s future, and “Reckless Love” from Cory Asbury in my opinion will play a huge part in it. If you are a fan of Cimorelli (as I am), then you’ll love “Reckless Love”, and you’ll probably hope that the band will cover more worship songs in the future, and then maybe sing an original worship song in the future with a well known guest vocalist worship leader. If you’re a fan of worship music, then you’ll also love “Reckless Love” and you’ll probably binge through Cimorelli’s discography, and hope that their songs are covered by another artist (Christian or mainstream) as that would really put them on the map. Either way, this cover by Cimorelli is revolutionary. So what are you waiting for? Check out one my favourite songs of the year, by one of my favourite artists ever!